WASHINGTON—In an effort to guarantee Americans the freedom to pick whichever mode of rapid ecological decay they desire, the Environmental Protection Agency rolled back federal emissions standards Friday to provide consumers with a broader choice over the type of apocalyptic hellscape Earth will inevitably become. 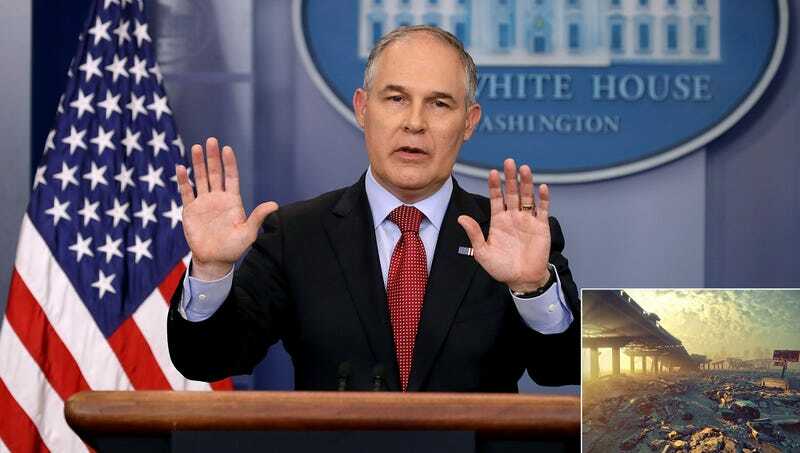 “Bleak, post-industrial garbage desert, nightmarish inferno of eternal noxious flames, or glowing green toxic acid swamp—no matter which unsurvivable wasteland you favor, eliminating fuel economy and automotive emissions standards will provide car buyers far more options as to how their imminent dystopias will look,” said EPA chief Scott Pruitt, who said current burdensome auto industry regulations unfairly limit consumer choices between the human race dying in uninhabitable stretches of desert as far as the eye can see, drowning in an unending series of massive tsunamis, or slowly degrading into a genetically corrupt pseudo-race dwelling in cities overrun by half-human mutant predators. “While some people want a world where every man, woman, and child on the planet dissolves to the bone within seconds of being exposed to a corrosive atmosphere, others prefer Earth to become a land ruled by leather-clad warlords leading tribes of diseased and malnourished warriors into battle over the last few remaining drops of petroleum. The decision of how to best leave the planet a charred and blackened husk must be made by the American people and not the federal government.” According to sources, a protesting California is expected to stick with stricter standards, thereby restricting consumers to choose between a few basic hellscapes shrouded beneath jet-black clouds of poisonous exhaust.